The Ultimate Complete Package Includes Everything inside & out+Steam Cleaning of all carpets, cloth seats, & mats + Head Light & Tail Light Restore to keep your lights clear and looking new. 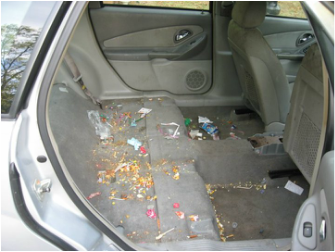 Our completes take a full day, If your vehicle is trashed you will pay the Full Recondition Price! Full Recondition Package For Sale By Owner Vehicles & Trashed or Extreamly Dirty Cash Price $160 Any Size Vehicle. Check Price: $200 Package Requires minimum 1-2 Full Days To Complete, Interior gets cleaned 2 times, Outside swirl removal then hand waxed & buffed. Swirl Removal Service Additional $30 to any package! Boats Starting at $15 per ft. whole boat/trailer cleaned & waxed & steam cleaning of carpet included. Must be hauled here no mobile, If it has to be hauled by semi we will be unable to do it due to low clearance issue. see boat below this barely fit! We Do Not Pressure wash engines!